In spite of the Navajo Office of Hearings and Appeals decision to disqualify presidential candidate Christopher Clark Deschene, 43, on a default judgment, voters can still cast their ballots for him as walk-in absentees. 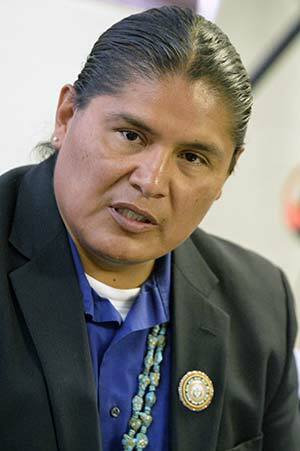 “Right now, its just hearsay until we get documents from the OHA,” said Wauneka in an interview with the Navajo Times. “So, right now, people can still vote,” he added. The number of people that have voted for Deschene during the 2014 Navajo Nation General Election, and whether their votes will count or not, is up to the Navajo Board of Election Supervisors, Wauneka noted. He said that the election supervisors would meet for a special meeting to determine if the voters that casted votes in support of Deschene would be counted. The election supervisors are expected to convene in a special meeting in the next few days, stated Wauneka.